Ellis Rogers is running out of time, but what does that matter to a man with his own time machine. A Detroit factory worker who’d always played it safe and done the right thing is rewarded with unemployment, a loveless marriage, and a terminal illness. Now with nothing to lose, he’s willing to take an insane gamble. It’s in his garage. He’s worked on it for months. All he has to do is press the red button, but he can only go forward with no control over how far. If it works he’ll face a world that challenges his understanding of what it means to be human, what it takes to love, and the cost of paradise. If he’s lucky, if he survives, he could find more than a cure for his illness; he might find what everyone has been searching for since time began. 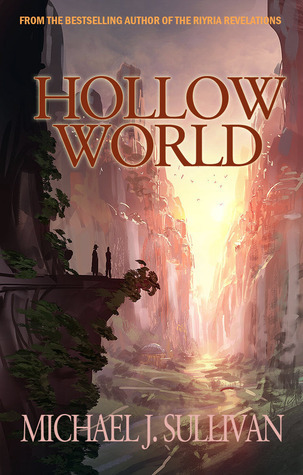 Welcome to Hollow World, a science fiction thriller from the bestselling author of The Riyria Revelations. "I’m a storyteller. I write books that I want to read, its the only way I know how to operate. When I finished Hollow World I knew I had something special, and unusual, and controversial. Hollow World defies classification. With elements of fantasy, science fiction, adventure, thriller, mystery, and even an unconventional romance it presents a huge problem for publishing: It doesn’t fit neatly. It’s one of those books that everyone loves (my agent, my editor at Orbit books, my beta readers) but because it is so unusual they don’t think it will sell. I’m going to prove them wrong." Michael J. Sullivan started out as a self-published author and his Riyria Revelations was picked up by Orbit later on. "Hollow World", as you might have guessed from the little quote I found on the author's website, couldn't convince the publisher, so Sullivan decided to publish it himself. I've heard many, many good things about his Riyria Revelations and I'm really excited to start the first book right about now, so I wanted to show my support and spread the word about this project. All the information about the book and the project can be found on the "Hollow World" website. If you want to back the Hollow World Kickstarter project, click here, you can get really cool stuff by donating, even a copy of the book six months before it will be published! If I wasn't flat broke, I'd love to donate, but being a student (and book-buying-addict) isn't really that positive for the contents of my wallet. The book will officialy go on sale on January 20th, 2014. I think this is a book I'd really enjoy, so I've put it on my to-read list and I'm looking forward to diving in to it as soon as I can get my hands on it! PS: Did you see that GORGEOUS cover? The creative genius behind that cover is Marc Simonetti, be sure to watch out for a Cover Artist post about him on this blog! Can't wait to hear what you think about Theft of Swords. You're very welcome! It sounds like a really great book. I started Theft of Swords yesterday evening and can't stop reading! I'm really enjoying it.